Over lunch in a crowded cafeteria in a downtown federal building, a peer asked why I never wrote for myself. Stunned in mid-bite, I admitted I never thought of such a thing. As an administrative director for a small federal agency, I wrote thousands of words per week, tweaking congressionals, composing strategic plans, even applying spin to investigation reports, but creative writing never crossed my mind. The idea, however, piqued my interest. After writing bad poetry and personal essays for several months, the concept of a mystery sat me up in bed one night. I'd been offered a bribe in my job years earlier, as a loan manager. The event shook my world, so why not craft it into a mystery? Two years later, the story made the rounds to professionals in the industry only to be soundly rejected. My fiction skills needed work. I tossed the stack of pages on a closet shelf, in a sealed manuscript box. But the writing bug had bitten and left a swollen mark on my need to be other than a bureaucrat. I wrote anything anyone would accept, jumping into magazines and online sites with fervor. Nonfiction came easy. I understood how to research any topic in depth thanks to my government career. I began building clips. While finding markets, I discovered contests; already knew grants from the day job. Then once some writers in Atlanta learned I knew such subjects, emails descended upon me. I turned answers into a newsletter, and FundsforWriters was born. From there I launched into a business, ecstatically proud about being thick in the world of words. Happy as a muddy fat pig in sunshine, I felt grounded . . . until five years later, when a published mystery author and I had dinner one night. With several novels under her belt, she asked what I wrote other than FundsforWriters and magazine features, meaning, what was my dream. Déjà vu the government cafeteria. What was I doing for me? I pulled down the old manuscript and all but gagged at its amateurish phrasing. Then I tossed the computer file so I wouldn't be tempted to cut and paste, and started from scratch. Four years later I completed a new version, landed an agent, and submitted the story to a few contests, placing in several. Two years later I held a contract. Today I hold Lowcountry Bribe that is every bit as beautiful as my first born son. And I'm grateful for every road block, every rejection, and every second-guessing moment I had along the way, because the stumbles made me stronger. I'm blessed that a friend pushed me to write, and another pushed me to keep writing my dream. I'm doubly blessed that FundsforWriters attracted so many writers, who now can experience my dream project. It's amazing how the universe works. Coming full circle is a humbling experience, and I continue to marvel at the intense power of opportunity that lies before us as writers, if we take notice. 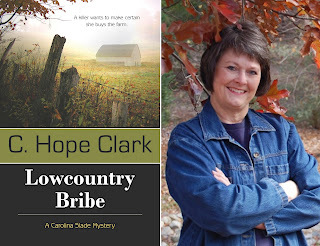 C. Hope Clark manages FundsforWriters.com, voted 101 Best Websites for Writers by Writer's Digest for twelve years. 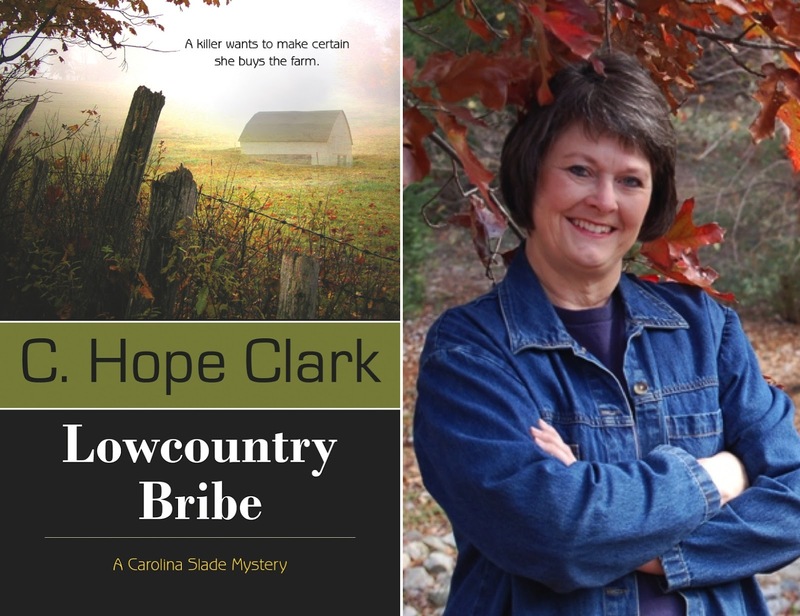 She is now the proud mama of Lowcountry Bribe, A Carolina Slade Mystery, published by Bell Bridge Books, February 2012. www.fundsforwriters.com / www.chopeclark.com She lives on the banks of Lake Murray in South Carolina. OMG! I relate to your post so much, Hope! Thank you. :) When you were sitting in that restaurant with your published mystery author friend, asking yourself what you were doing for YOU, I felt like you were speaking directly to ME. I've recently decided to refocus on my novel writing, and it feels great. BTW, I've ordered your book, along with a lot of books recently that I've been meaning to read! Darcy's open letter post reminded me of what it means to be both a writer and reader, and your post opened my eyes again to the importance of tending to my own creative needs. Oh yes, we can get so sidetracked trying to fill needs, build platform, and respond to others that we forget about our creative personal interests. Whether we're doing websites (like WOW and FFW) or tending families, we often neglect our muses. They need nourishment, too, for us to be our full selves. Thanks so much for ordering Lowcountry Bribe. I believe I'm prouder of it than anything I've ever written. I once shared an office with a man who wrote ebooks long before they became popular. He inspired me to try writing. That's what friends do. What a thrilling story of your path to publication! Yay, Hope! You've spent years helping other writers, now's your time to have fun. Congrats and best wishes. Thanks for inspiring me to bring out that old manuscript hiding in the back of my file cabinet and never give up on that dream! Road blocks, be warned: you will be conquered!